Claudia Pozzana, Allessandro Russo and David Zweig were students together in Beijing in 1974-76. They witnessed many of the same events and underwent similar experiences. Yet how they each saw those events depended on their own perspectives on China, society, and ideology. The three will present their own views of those days and how they affect their own understanding of reform China. 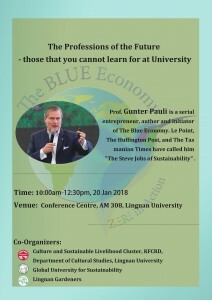 Professor Gunter Pauli, the author of The Blue Economy and Gunter’s Fables, and Sir Run Run Shaw Distinguished Visiting Scholar, CUHK, 2017-18, delivered a lecture on “The Professions of the Future – Those That You Cannot Learn For At University” at Lingnan University, Hong Kong, on 20 January 2018, which was organized by the Department of Cultural Studies of Lingnan University, the Global University for Sustainability, and Lingnan Gardeners. Professor Pauli explained the spirit of the Blue Economy as a commitment for the common good and introduced a lot of innovative projects such as Li-fi, stone-paper, pig-chicken friendly farm, tomato-producing-water farm, coffee-clothing, among others. On 24th November 2016,Prof José Wellington Santos presented a lecture at Lingnan University.The lecture was video-recorded by Jin peiyun and George Lee, edited by George Lee, and produced by Global University for Sustainability. Professor Ackbar Abbas delivered a lecture on “Posthumous Socialism” on 23 October 2017, which was organized by the Department of Cultural Studies, Lingnan University, Hong Kong. This video was edited and produced by Global University for Sustainability, October 2017. What is the Socialist Market Economy? Are we dealing with another phase of socialism? Or is China today capitalist in everything else but name alone? Or, even more paradoxically, are we dealing with neither the life nor death of socialism, but with its afterlife? With a posthumous socialism more than a post socialism? Socialism in its posthumous form can have a vitality stronger than ever before. It is not a case of socialism being more alive than dead in China today, but a case of socialism being more alive when dead: just like a preserved building. A socialist past is not just succeeded and replaced by a capitalist present, but coexists with it, and we are forced to inhabit overlapping time frames. Hence, anachronisms of a new and peculiar kind are everywhere. Anachronism does not mean being behind the times; rather, it is a sign of the times, a product of the speed of historical change. However, what we will see in the coming period is not just change in any familiar sense, but rather how change itself has changed. Ackbar Abbas is internationally renowned for his writings on Hong Kong and China. His book, Hong Kong: Culture and the Politics of Disappearance (published in 1997 by University of Minnesota Press) is a path-breaking work in urban studies and cultural theory. His scholarship spans a range of cultural practices, from cinema to architecture to the visual arts. He has been writing on art and visual culture in China, and speaking at important international art events like the Sydney, Venice and Moscow Biennales on Asian art. Before moving to UCI in 2006, he was Professor of Comparative Literature at the University of Hong Kong. He is also currently Adjunct Professor, Department of Cultural Studies, Lingnan University. On 13 November 2017, Tang Li-fang gave a seminar on “Blue Economy and Gift Economy” in Lingnan University, Hong Kong, China, which was jointly organized by Lingnan Gardeners and Global University for Sustainability.